Be sensible: A Wat is a sacred building. As a rule of thumb, don't do anything you wouldn't do in a church. In Thai "sila" means "stone" and "ngu" means "snake", so Wat Sila Ngu stands for "Stone Snake Temple". This beautiful red colored temple, also known as Wat Ratchathammaram, is located between Lamai and Hua Thanon beach in the south of Koh Samui. It is easy to find just off the 4169 ring road, about 1 km south of Hin-Ta and Hin-Yay Rocks. This Wat is one of the most popular Koh Samui Temples among the local Thai Buddhist population. We definitely recommend a visit if you find yourself in this part of the island! Inside the building, you will see beautiful artworks, sculptures and impressive Buddhist illustrations. Outside, there are interesting sculptures of Buddhist deities and animals, including snakes (hence the name). There is also a lovely seated area overlooking the scenic bay of Hua Thanon. It’s a great place to sit back, relax, and enjoy the views. Tip: It is a good idea to visit Wat Sila Ngu and Wat Khunaram (Mummified Monk) in the same morning or afternoon as they are 5 minutes drive away from each other. This temple is located on the top of a hill in Chaweng, near Samui International Airport. You can't miss it if you drive towards Chaweng from Thai International Hospital. When you turn left at the intersection you will see the golden pagoda from the road, up on a hill. Wat Khao Hua Jook is nestled in the mountain wilderness almost decorating it with the golden pointy pagoda at the top. From the temple you will enjoy some fabulous views of the surrounding mountains, Bangrak bay and the airport. This Koh Samui temple is without a doubt, the best spot to contemplate airplanes taking off and landing on the island. The surroundings are beautiful as you reach the top of the hill. Tip: Don't miss this temple if you love plane spotting! A must-see when visiting the island! Big Buddha Temple in Koh Samui is the Buddhist temple on Koh Phan (also spelled Koh Fan or Koh Faan), a small island offshore from the northeastern area of Koh Samui, next to Bangrak pier. It’s house to a 39 feet gold painted Buddha statue, built in 1972. Wat Pra Yai has become one of Koh Samui's most visited Wats, and a major landmark. 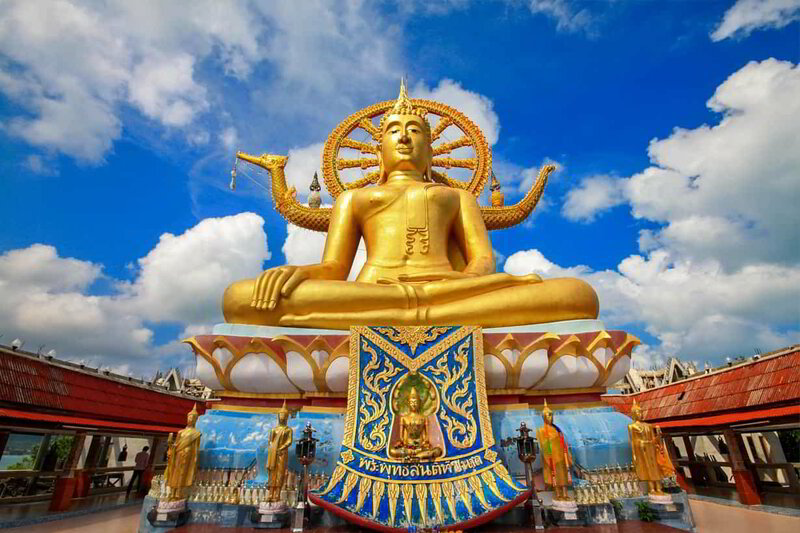 If you fly to Koh Samui, you should be able to see the big golden statue from your plane before landing. 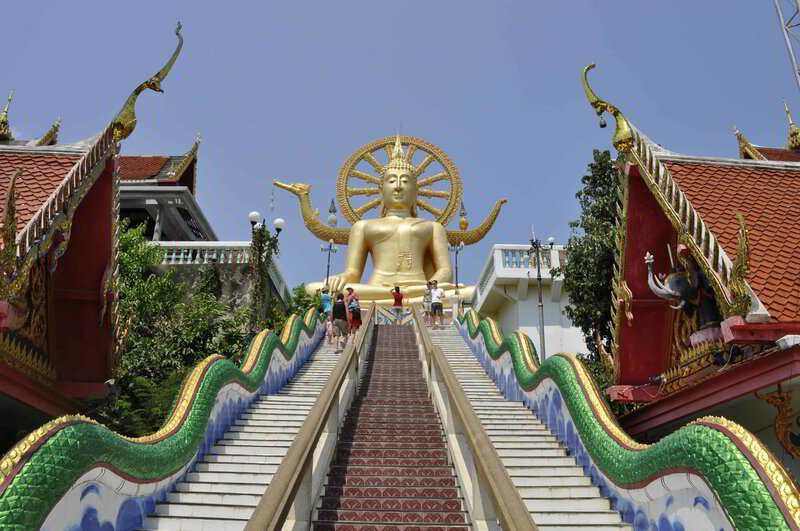 The temple is about 3 kilometers directly north of Samui International Airport. Around the statue's base, there are vendors selling religious artifacts, amulets and other types of souvenirs that you can take home with you. Tip: Big Buddha is open to visitors all day. If you’re hoping to catch a true cultural experience, try to go in the early morning hours when local people bring their offerings and the monks do their morning chanting. Tip: Visit in the same morning or afternoon Wat Plai Laem as they are close to each other. An impressive temple complex on Koh Samui, situated on the north east coast. 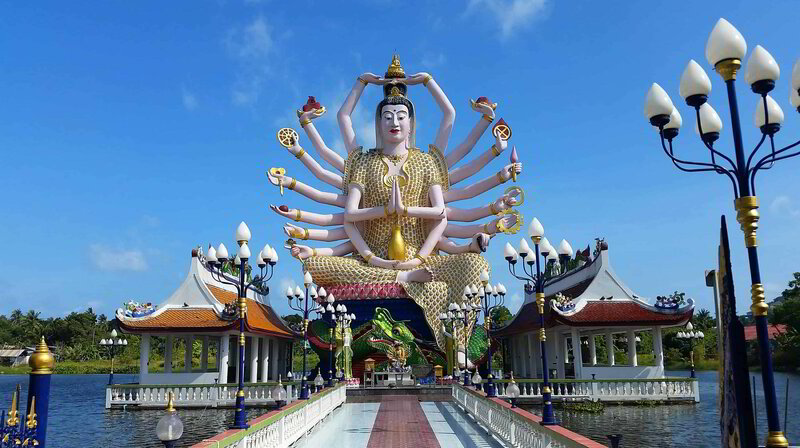 Its main statue is a striking white 18-arm image of Guanyin, the Goddess of Mercy and Compassion. The temple's design, though modern, incorporates elements of Chinese and Thai traditions and part of it was designed by distinguished Thai artist, Jarit Phumdonming. In addition to the main Guanyin statue, there is also a white statue of Budai and smaller shrines dedicated to Ganesha, Vishnu, Shiva and Sakka. Wat Plai Laem is a living and active temple, where devotees come daily to pay homage to Guanyin and the Buddha. Adding to its feel of tranquillity, the temple is surrounded by a lake, which is teeming with fish. Visitors who make a donation to the temple are given a bag of food to feed the fish. To get to Wat Plai Laem, take the main route 4169 up to the northeast region of Samui, then turn off on route 4171. It is very close to the Big Buddha temple.What a wonderful place to visit. Tip: If you travel with kids, there is a lake with plenty of fish to keep the little ones entertained. You can buy fish food to feed them on-site. Tip: Visit in the same morning or afternoon Wat Phra Yai (Big Buddha) as they are within few minutes drive from each other. This is an active temple, local Buddhist people come here to make merit and prey. Several items, like Buddhist amulets can be bought here. Although the Mummified Monk at Wat Khunaram might be an unusual sight for foreigners, it offers a unique insight into Buddhism and Thai culture. Wat Khunaram is located West of Hua Thanon and South West of Lamai Beach. Tip: You may check your fortune at Wat Khuranam. You will find some sticks with numbers, in a wooden container. Shake the container until a stick falls, then check the number on the stick and match it with a fortune card at the board. Tip: Get a blessing from the monks if they are not meditating when you visit. The monk will bless you and your family and will tie a band on your wrist for good luck. Every little helps! 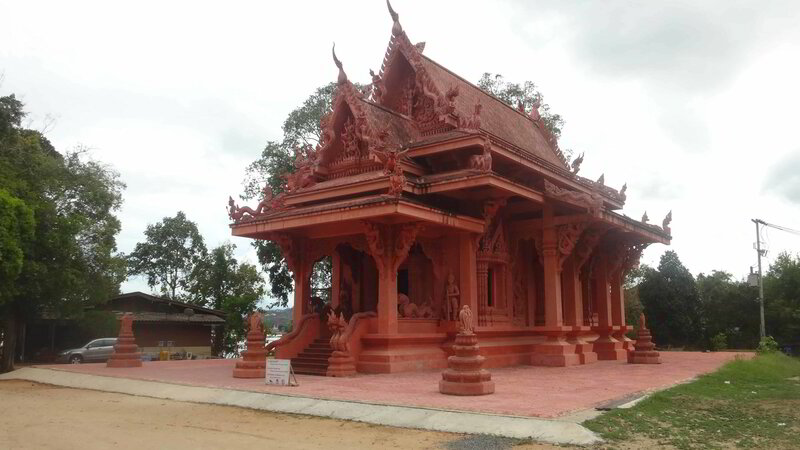 Tip: Try to visit Wat Sila Ngu too in the same morning or afternoon as it is less than 10 minutes drive from Wat Khuaram. KOH SAMUI TEMPLES - DAY TRIP BONUS! This is one of less known temples in Koh Samui, situated in the South corner of the island. 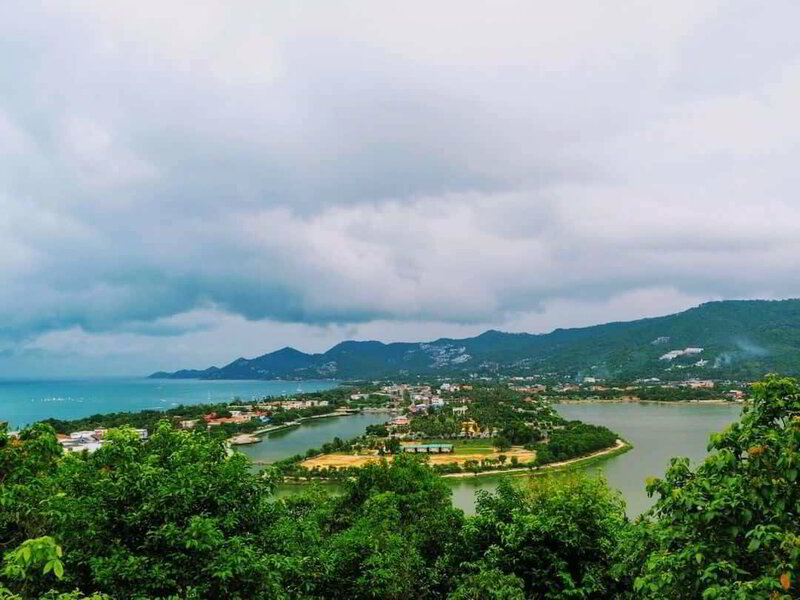 This part of Samui is not much visited and is quiet, compared to the Eastern side. Wat Khao Chedi sits at the top of the hill above Laem Sor. Frequently, visitors get Wat Khao Chedi confused with Laem Sor Pagoda, but they are two different pagodas. Laem Sor Pagoda sits right at the end of the rocky beach of Bang Kao. To reach Wat Khao Chendi there is a steep hike up a hill, but the views are totally worth the effort: there are several vantage points at the top with panoramic views over the 5 islands, Laem Sor and Bang Kao Bay. In the Wat you will find some unique monuments and sculptures: a few small, gold and white Buddha Statues (amazing in the sun) and a big stunning sleeping Buddha statue. A very peaceful and serene place!! Tip: If you are based in Bohput or Chaweng, there is a relatively long drive. Visit Laem Sor Pagoda, and Wat Khao Chedi when you are planning to be around Taling Ngam. You could make a visit to Koh Tan Island and Koh Mudsum in half a day and for the other half, you could visit the temples. Tip: At KohPlanner we offer a fantastic package from one of the best tour host company in Samui, to visit Koh Tan Island and Koh Mudsum. Check the details HERE and book away!